Just months after Ennead completed its renovation of Brooklyn Museum’s Great Hall, originally designed in 1897 by McKim, Mead & White, Situ Studio will transform the 10,000-square-foot colonnaded space with a site-specific installation set to open March 4. Entitled reOrder: An Architectural Environment by Situ Studio, the work will transform the hall’s 16 classical columns with nearly 2,200 yards of Sunbrella Canvas-Natural fabric, which is to be folded and stretched over suspended bent-steel tubing and plywood rings with diameters ranging from 5 to 20 feet. Beneath the fabric shapes, Situ will install benches and tables fabricated with LG Hausys HI-MACS solid surfacing, creating the rounded benches with a controlled heat process called thermoforming. By reorganizing the 24-foot-high space with the new installation, Situ hopes to create both grand and intimate volumes within the hall, encouraging visitors to spend time there for a wider variety of activities. 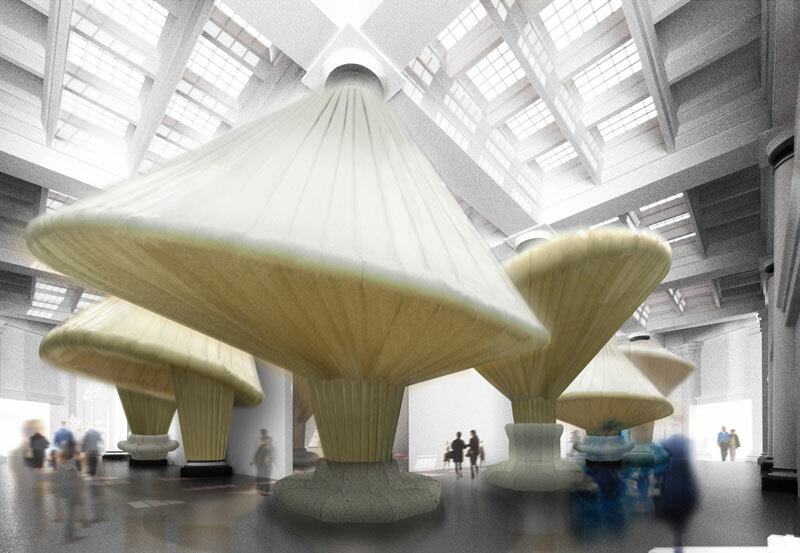 In order to realize the billowing forms they’d imagined as an extension of the hall’s classical architectural features, the studio examined techniques for folding the forms’ fabric covers, eliminating the need for cutting or patterning. Physical models and mock-ups began at a scale of at ⅛ inch to 1 foot and ½ inch to 1 foot, then grew to quarter- and half-scale models using true column dimensions. Ultimately a full-scale model allowed the studio to study the behavior of various fabrics. Firm principals Brad Samuels and Aleksey Lukyanov (the project manager) said Sunbrella’s fabric carried key performance characteristics not found in other material tests: strength and durability, resistance to fading, UV light, water, and spills, and the overall easy maintenance needed for a museum environment. As the installation’s opening day draws near, Situ is still testing the lighting component to be suspended within the volumes. But the sculptures’ life won’t end when the museum closes the installation in January 2012—the fabric will be returned to the manufacturer or reused by Situ for a future project.